I’ve also wondered how fundies would react if there were a test that could show that a developing fetus would most likely grow up to be gay. Would they condone abortion in such cases? 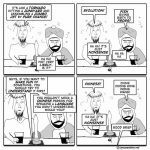 nice one, religion and their random taboos… never cease to impress. just today I was watching in the news the man with no face, a Jehovah’s witness that did not extirpate a small tumour in his face due to the restriction on blood transfusions of his religion, and now looks like a person attached to a tumour. Well, I guess you gotta take his comittment to his religion seriously. Eep! 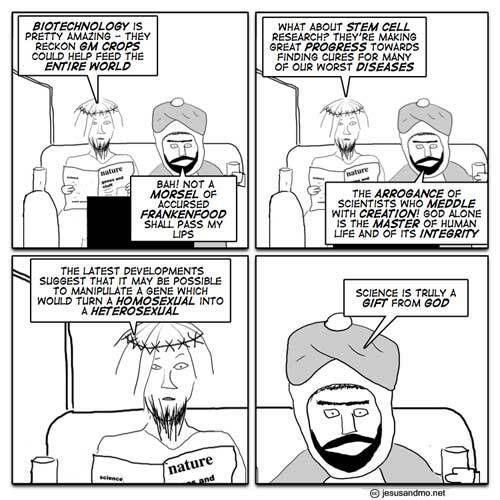 Funny comic, but the GM foods comment is crap. Not only are they dangerous, but we’ve already got enough food to feed the world. The problem is allocation. Apologies for the links, but they’re worth reading. Soon, genetic treatments may allow for changing the profile. Welcome to the world of designer babies. If that happens, how many parents — even among those who consider themselves most liberal — would choose a gay child? How many parents, armed with this diagnosis, would use the patch and change the orientation? I assume you have evidence to back those dubious claims. There are a lot of problems with GM food that don’t involve religious believes. One of them is that farmers (including those in 3rd world countries) become dependent on companies like Monsanto because of patents. This doesn’t excatly help feeding the world. GM food isn’t bad in itself. It becomes bad, however, when the vast majority of GM crops grown (some 90% I think, without actually remembering my sources), only bear a gene conferring resistance to herbicide or make the plant generate its own pesticide (that’s in cotton, so nobody eats it). There’s a tremendous potential in GM crops, but only if used sensibly – and outside of Monsanto patents, it would seem. To say that there’s enough food in the world, and it “just needs to allocated”, is callous, ignorant and naive. O RLY? All the luxury and inefficient food like cattle used by McDonalds fed tons of grain every day, plus the lack of development of entire arable areas on the planet that are never farmed since farming is a business nowadays that needs investment, you’d really think the world is that barren? I know, I have no direct link,but I just need some solid proof about the urgent need for GM crops. It sounds ridiculous. Sorry Kristian, I couldn’t disagree more. There are studies, including the one I have linked above, that shows there is enough food. To state otherwise is ignorant, to state otherwise when you have the evidence is callous. Naive; well, we are all naive. i don’t think kristian is actually arguing that there isn’t enough food, just that the idea that the world problems can be solved by just reallocating it. it can’t, the system that has created this over production is complex and fragmented. you can’t just reallocate mcd’s beef and soya and use it to feed the world, that assmption is indeed, callous, ignorant and naive. GM or non-GM, as long as it keeps people from starving, what’s the difference? Whichever can be delivered where it’s needed quickest and cheapest, that’s all that really matters, isn’t it? Um, what about a GM crop getting out of control? Anything can happen. As far as I remember, genetics involve gadzillions of A-T-C-G combinations that determine a living being. Well, I guess, that could work. In a good world. But I recall seeing many years ago in Sudan market stalls piled high with bags of grain stenciled ‘Gift from the USA’ and sold very cheaply. and seeing the irrigation works fall into terminal disrepair because you can’t make a living if the crop you are growing is given away free. For now. With understood conditions. For some, food can be a weapon. They are scum, but they influence the way the world wags. Donating food to poor countries produces more problems than it solves because it makes the local economy collapse. The world isn’t that easy, unfortunately. It may be necessary to avoid a big famine once in a blue moon but that’s it. How shpuld local farmers survive when we provide free food. They can’t compete with this price. The same goes for cheap, subsidised food (and other products) from our rich countries. No local farmers garantee the next famine. It’s our economy that keeps poor countries poor. GM crop won’t change that. erm, yeah sorry to burst the bubble and everything, but I work at a food research institute in the UK. GM food has been produced here and put in the supermarkets. It was consumed by many with zero ill effects, until the ridiculous scaremongering began and the supermarkets decided to stop selling it just for the sake of PR. No problems have ever been found with any of the products produced here. They are safe and useful. GM corn and rice products have allowed areas of the world to feed themselves that would otherwise have no where near the required food production for their populous. GM foods are now being grown in some african nations that would otherwise be untenable due to pest and disease that these products are modified to resist. This has allowed these farmers to use the land they have to feed themselves, and sometimes even to employ others. GM food has saved millions of lives that would have been lost to starvation and has yet to cause a single death. wow… when did this website turn from entertainment to world politics and activism? Think we all need to dial it back a bit. GE fears as they stand are unwarranted. The techniques are more detailed, precise, safer, and better tested than traditional breeding. Not a single person in the world has had a confirmed case of a complication arising from consuming food that has had a transgene inserted into it. In contrast, traditional breeding, which everyone accepts, has had accidents. the worst danger about GM crops is genetic Ã¢â‚¬Å“pollutionÃ¢â‚¬Â, that is when they crosspolinate with non GM crops. The problem is that these GM genes are dominant and actually wipe out nonGM crops when cross polinated. That is so far off the mark – it reminds me of the piles of dreck that creationists claim about evolution. A little research goes a long way. Patents are involved, but they only last for 23 years, I believe. Then anyone can grow them. Also, there are groups working on open-source genetic engineering tools that do not require the use of patents. These will be to Monsanto what Linux is to Microsoft. People in other countries are very dependent upon us, and it behooves us to help them become agriculturally independent. GE technologies can help them do that. What we do not need more of are European countries threatening to cut off imports from developing countries that are considering GE crops (or even accepting food donations that include GE food), which is little more than Old World colonialism. One of the things that we really need is better communication of this field. That’s one thing I try to do on my blog and podcast. After all, I’m a grad student in plant breeding and genetics. Too many people living on a piece of crap land that can not support the population? Import enough food so they can keep reproducing and the problem continues. Darwinism held in check by technology. really able to support them. Soon we will have recycled water from our pee? Oh yes, absolutely — Monsanto’s products are devastating for the environment, and a terrible deal for farmers, so I fully support a boycot of GM. Similarly, I am boycotting milk, chocolate and coffee, following the really quite awfull behaviour of Nestle. And because Nike use sweatshop labour I have become a full time naturist. I have been free from association with the medical profession since the whole Harold Shipman thing. Appologies, by the way, for this message being so late, but I had to send it by snail mail — the dubious practaces of microsoft mean that I an boycotting software. Come on. I know you guys are better at spotting bad arguments than this. It never ceases to amaze me how intelligent, rational, critically thinking people can fall on a single piece of nonsense, and make all of the same argument faux pas that they criticise in other nonsense. Suddenly they think it’s acceptable to use technical terms like “dominance” without finding out what they mean, or whether the Greenpeace press-release or Daily Mail article that they read it in bear any resemblance to reality. Would any of you make similarly uninformed comments about evolution, climate chance, HIV/AIDS, the MMR vaccine, or quantum physics — even if you had seen a YouTube video about them? GM is not a black and white issue. Escaped from LA. Realized that it followed me to Oregon. Arable land and timber being populated by consumers with high standard of living expectations. And we’re trying to make everyone feel wanted (fed, clothed, and mobile) on the planet without respect for carrying capacity. And we call ourselves educated. 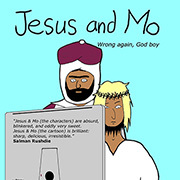 I so much agree with that other comment that commentators here on Jesus&Mo are eloquent & interesting to read (their ironic self-referential attempts of humour notwithstanding). GM crops are in my view unlikely to have much detrimental impact on people’s health – as we screw ourselves up with all sorts of potentially dangerous, all-natural or not-so-natural products anyway (I say as I sip my coffee & nibble my biscuits). And following at least some analysis and forethought (yeah, right..) GM crops are also unlikely to have any lasting effects in the environment, as what we introduce in plants is entirely unlikely to help the plant itself as it and its offspring are exposed to natural selection. Check for example what effects 7000 years of non-GM plant breeding has had on natural populations, outside of direct human agricultural interference. The latter, which admittedly counts for quite a lot in itself. Yes- let the darkies starve while we indulge our scientifically illiterate moral posturing about things we barely understand. Like genetics. Or sums. Or words. Get back to the trees hippies. I wasn’t talking to you, but hey- if the cap fits then by all means wear it! And being a biologists does not make you immune to talking utter crap- remember Steve Gould? Muslim fundies would kill it. Christian fundies would “educate” it. The darkies starve because of business, because they don’t have anything we want. Aw. You made is one on my birthday. There’s a way to manipulate that gene? Can I get it in pepper spray form so i can turn jehovahs witnesses gay?